I passionately wanted to learn to scuba dive, but I understood that my fears could cause panic under the water, and so I was left with an empty longing for a world that I didn't know how to visit. I grew up in Laguna Beach, Calif., a small seaside community, where from sunrise to sunset I remained firmly planted on the shore with my toes deeply buried in the sand. It wasn't until sleep was unavoidable that I scurried up the gravel cliffs and departed the ocean's side. My friends called me the Pacific Bunny because I could make it up and down the dunes with frightening and fearless dexterity. Each morning the water was full of bleach blond surfers waiting to partner with the breaking waves. While I admired their skill at balancing on skinny planks while gliding over curling liquid, surfers did not hold my attention. My gaze always fell past the whitecaps out to the never-ending vista that acted as the roof and ridge to the world beneath the surface. I named this inaccessible place "The Invisible Residence" and longed to explore the secrets of this hidden domain. But I was afraid. After years of watching lifeguards pluck intrepid tourists from the surf I feared the ocean as much as I loved it. On busy beach days the locals would take bets on how many "in-landers" would need to be rescued. A lack of respect for the power of the sea is a dangerous thing for anyone who takes a visitors pass and crosses breakwater. I passionately wanted to learn to scuba dive, but I understood that my fears could cause panic under the water, and so I was left with an empty longing for a world that I didn't know how to visit. We live on a planet that we call earth, but really we are a planet of water. Oceans make up about 70 percent of our world's surface. In the computer, cell, text mania of synthetic reality in which we live it becomes harder and harder to disconnect and experience the incorruptibility of nature. Scuba diving not only allows an individual to appreciate the environment, it allows them to become part of it. For those who love to explore, expanding your passport to the world beneath the sea vastly expands your options. Years passed before I met my friend Richard. He is the kind of man that makes Indiana Jones look like a sissy. He repels from helicopters and tosses machetes with wicked precision for casual recreation. I told him of my ocean fantasies -- and fears -- and he quickly introduced me to a master dive instructor. After two years, a trip to Hawaii, several "missed boats," and multiple weekends on Catalina, I had accomplished three of four basic dives and still wasn't certified. I decided that it was time to stop being such a wimp. Step one. Find a local dive store. Channel Island Scuba (CIS) was God's way of cutting me major slack for not having thrown in my beach towel and given up. Chris Emch, the store's owner, is a Dive Control Specialist Instructor, PADI Master Scuba Diver Trainer and NAUI Instructor Trainer. He is qualified to teach every specialty that SSI, PADI and NAUI (the three largest scuba certification programs) offer. Chris, along with Jay Fischer, one of his core team instructors, are also members of the Ventura County Sheriff's search and rescue dive team. Having someone around qualified to rescue me sounded like a very reassuring idea. The day I wandered into the store Jay wrapped his arms around me and assured me that he was going to do whatever it took to make me feel safe under water. Jay is the kind of man who hugs you, encourages you, supports you, looks you straight in the eye and tells you that you are doing GREAT even when you are hyperventilating. Chris listened to my history, threw out credit for anything I had ever done and told me I was starting over. He wanted along with Jay to personally supervise all four basic dives, demonstrate comfort with beach entries, and redo every skill to his team's satisfaction. It was so absurd that I just had to laugh and agree. My daughter decided she was taking personal responsibility for my accomplishing this little dream, so she signed up for classes as well. Because she only had five days left on her home visit to Los Angeles, Chris and Jay basically cancelled everything in their own lives to set aside the time to get us both up to speed, through the book work, into a pool for "rehearsal" and over to Catalina. Sitting on the dock in Catalina made me feel as if I was watching my life in slow motion. I stared at the beautiful ocean wondering if the "Invisible Residence" and I might finally become friends. As I walked down to the water, I felt my fears simmering, but, rule one: breathe. "You are the only thing in your own way, " said Chris. He gave me a hug and jumped in the water, then my gorgeous daughter followed. I leaned back and slipped into the cool surf and very slowly started swimming. I could feel the edges of panic trying to make their way into my mind as water churned around me. Jay got hold of my attention and held on to it. "We are going to go down to the bottom and and just sit there," he said. "If you want to swim back up that is totally fine. Just like the pool. I'm right here with you." The moment I let go and glided under the surface I relaxed. I hated the choppy motion around me on the surface but melted into the calm world below. Catalina is known for its stunning kelp forest that rises from the ocean floor up to the edge of the surface. Every direction offers a new, continually rotating vista of striking fish and completely distinctive landscape. Light from above spills down through the surface and illuminates each fragment of the ocean in it's own unique way. Schools of fish wrapped themselves around us in one moment, and then in the next we were engaged with a scurrying crab, examining a sea cucumber, or catching sight of an urchin tucked into the rocks. As we explored the underworld water garden we were joined for several minutes by a giant sea bass -- a mythical looking creature whose body was the size of a Volkswagen. 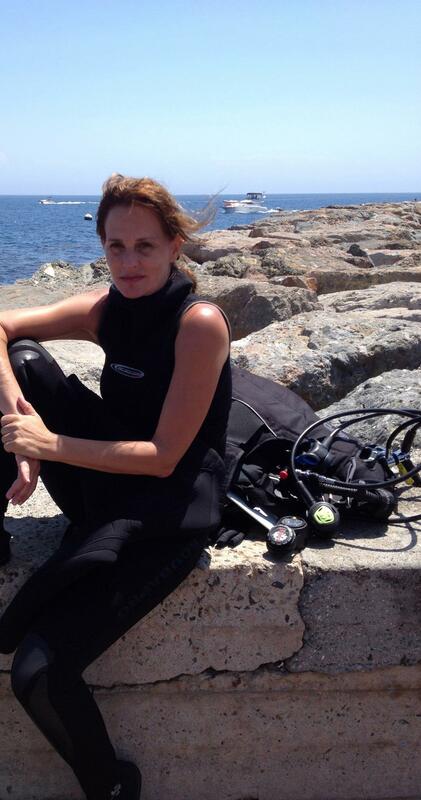 Later in the week Jay and I drove to Santa Barbara to do a beach dive off Refugio State Park. We spent the morning examining patterns of the sand under the water and he explained to me the tides and currents and how to navigate one's journey. We saw dozens of starfish with purple bellies, bat rays sailing by, and handfuls of pipefish whose pinstriped decor look as though they are wearing prison garb. At one point Jay picked up my dive computer to point out that we had been under the water for almost 40 minutes. I had not thought about anything other than how sad I would be to leave. As we swam along I noticed a tail protruding from a creature nestled under the sand, and it reminded me of how I used to bury myself along the shore as a youth. I gently reached out and skimmed my fingers over it, and a six-foot angel shark woke from his nap and darted through the water. Jay was so shocked that I had suddenly become comfortable enough under water to be petting sharks that I burst into laughter -- which is a wonderful thing to do beneath the sea. For more by Kate Moulene, click here.